stefanw1337 1 year, 12 months ago. Here is the much awaited Nougat 7.0 ROM for Nexus 6 CM14 (CyanogenMod 14). For latest updates, stay tuned to the Lineage OS 14.1 device list page. This Nougat 7.0 has come for Nexus 6 (shamu) via CyanogenMod 14 ROM. Since Google released Android Nougat Source code, we have update many Android NOUGAT AOSP ROMs and also many CyanogenMod 14 ROMs updated and many are yet to come. 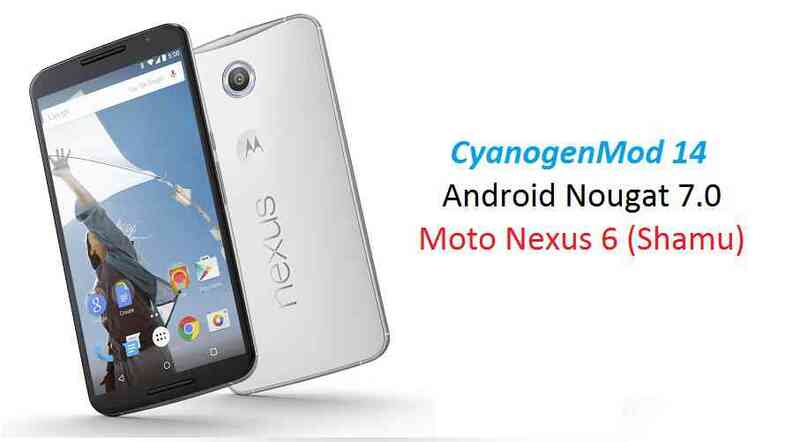 This CyanogenMod 14 for Nexus 6 is brought to you by developer neobuddy89 and one more from Lycoris. You can also try the AOSP Nougat 7.0 ROM for Nexus 6. If you like developer’s work and want to help them, then please Donate to neobuddy89 via PayPal using this link. Installing a custom ROM on a the Nexus 6 may require the bootloader to be unlocked on Nexus 6 and a Custom Recovery on Nexus 6, which may VOID your warranty and may delete all your data. Before proceeding further you may consider backup all data on the phone. You are the only person doing changes to your phone and I cannot be held responsible for the mistakes done by you. ALSO KNOW THAT THIS IS A DEVELOPMENT BUILD AND CONTAINS MORE BUGS THAN YOU CAN THINK. Unlocked bootlaoder on Nexus 6 and TWRP recovery on Nexus 6 (shamu). Download and Copy the Nougat GApps and Nexus 6 CM14 Nougat 7.0 ROM ZIP to Nexus 6. First flash the Nexus 6 CM14 ROM ZIP from device. Reboot and Enjoy the CyanogenMod 14 Nougat ROM on Nexus 6. Copy the Nexus 6 CyanogenMod 14 Nougat 7.0 ROM ZIP file to your phone. The development thread for neobuddy89’s Nexus 6 CM14 Nougat 7.0 ROM is here. So none of the CM14 files works for me, this guide says 14, but he downloads are 14.1(dunno if it matters). I tried the nightly 14.1 and both of those linked here. Every CM14 package gives error 7: “can’t install this package on top of incompatible data. Please try another package or run factory reset” even though the system is wiped clean(so what data exactly??). If anyone can help that’d be amazing! Edit: So after thinking some more and looking at the guide. I didn’t actually selectto wipe the “Data”. So when I did I could install the 14.1 Nightly one.